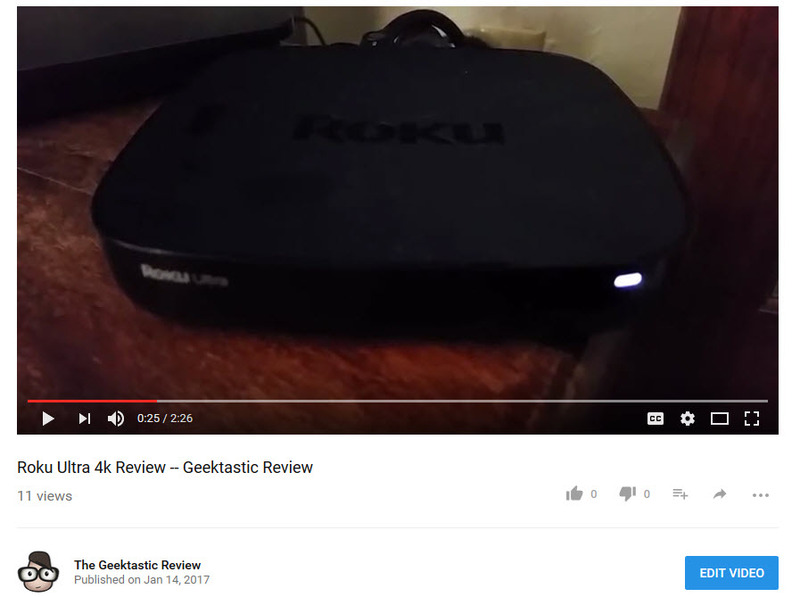 This video is my review of the Roku Ultra. We got it about a month ago and we also had gotten the most recent Amazon Fire TV, and I like this a lot more. There are a couple things that are good about the Amazon Fire TV. For example, it kind of works a little bit like an Amazon Echo, but the positives for the Amazon Fire TV end there and the Roku Ultra I like a lot more. One of the biggest things that really surprised me about the Amazon Fire was it didn’t have a separate audio port. It just had the HDMI, so you had to use the crappy speakers on your TV. Assuming your TV didn’t have an audio out that worked, which mine has an audio out, but it didn’t work. This one actually has an optical cable that you can plug in, and I definitely like that. One of the coolest features is the remote. It has a headphone jack so you can actually watch TV. I have kids, and so right after they go down I can watch TV and not have to worry about waking them up. We had a Roku 2, and one thing that we do notice is that this is a lot faster in terms of how long it takes to go to different things. As you can see, it’s very snappy and it’s definitely a lot richer. Now, I don’t have a 4K TV, so I can’t comment on how well that works, but I know that is something that’s a nice feature. On the previous Roku we couldn’t switch between the profiles. The software was clearly inferior. Let’s see, I push the Hulu button. I like that it has the Hulu and the Netflix button because those are actually the two most common there. I wish it had an Amazon button, but that’s probably asking for too much. Overall, I highly recommend it, and I do like it a lot more than the Amazon Fire TV. Just like an Amazon Fire TV it does have … You can’t see it. Let me get a little bit more light. This is a voice search button, so I could do something like I press and talk into it. MythBusters. It’ll search in there for MythBusters. You can see my kids talking about that. Anyway, I highly recommend it and I really like the Roku Ultra. I’m excited to get a 4K TV to test it. Please like this video. Thanks for watching. Bye, bye.